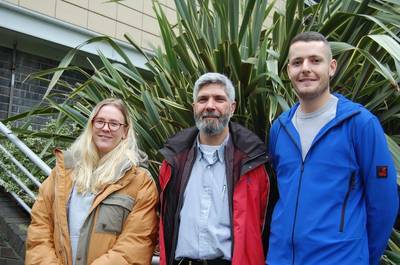 A team from Newcastle University has arrived in Antarctica this week as part of a major new research project to measure the rate of uptake of heat and CO2 in the Southern Ocean. Dr. Miguel Morales Maqueda, Alicia Mountford and Liam Rogerson from Newcastle University have joined the ORCHESTRA research project (Ocean Regulation of Climate by Heat and Carbon Sequestration and Transports) to carry out sea surface measurements using a Wave Glider. Fitted with a GBS antennae – a highly accurate GPS system – the glider will survey the ocean surface, measuring properties such as near-surface meteorology (wind, air pressure and air temperature), waves, ocean temperature and currents. Led by the British Antarctic Survey (BAS), the aim is to gain a better understanding of the mechanisms that lead to the transfer of heat and greenhouse gases from the atmosphere into the ocean and how they are subsequently distributed globally. The Southern Ocean takes a staggering 75 percent of the heat and 50 percent of the CO2 from all human emissions absorbed by the global ocean. However, details of the mechanisms that lead to the transfer of heat and greenhouse gases from the atmosphere into the ocean and how they are subsequently distributed globally are not known. ORCHESTRA will conduct several oceanography surveys and deploy moorings and autonomous vehicles incorporating a variety of sensors to help gain further insight into these problems. Explaining the involvement in the project, Dr. Maqueda said, “We have been invited to participate in ORCHESTRA on account of our expertise in the use of surface robotic systems to carry out sea surface measurements. We use a Wave Glider, which is an unmanned vehicle, to conduct surveys of the ocean surface measuring properties such as near-surface meteorology (wind, air pressure and air temperature), waves, ocean temperature and currents. The Wave Glider relays this information back to base via satellite. The Wave Glider, which in its basic form is a commercial vehicle, started life at the National Oceanographic Centre (NOC) in Liverpool and was brought to Newcastle University by Dr. Maqueda. Custom fitted by Newcastle University to include the GBS antenna, this allows the movements of the sea surface to be followed with great accuracy. The Wave Glider will actually be piloted from Newcastle by Dr Nigel Penna, Senior Lecturer in Geomatics, and by Peter Foden at the National Oceanographic Centre in Liverpool. Most of the data can be received almost immediately from the vehicle and relayed back to the UK and to Dr Maqueda and his team on the RSS James Clarke Ross. Some of the sea data, which would involve very large files, will be downloaded at a later date. Linked to the project, but covering a different theme, is Alicia Mountford’s work; PhD student Alicia will be travelling on the RSS James Clarke Ross and surveying the concentration of plastic in the water at depths of 4,000 to 5,000m below sea level. Key research themes such as temperatures and CO2 levels in oceans are long term projects funded by government laboratories BAS and NERC. Orchestra will run for five years and it is expected that it will then continue, making it a 10 year project. Dr. Maqueda and his team flew to the Falkland Islands on November 15 where they joined the scientific research vessel, the RSS James Clark, to travel to the Antarctic to reach the BAS headquarters at Rothera. From the base they will use the RSS James Clark to deploy the Wave Glider in a 24 hour mission. The Wave Glider will then travel under the water collecting data before it can be retrieved in January 2018.